A negative body image can lead to anxiety and depression, affecting our self-esteem, gender identity, mood, level of sexual fulfilment and eating patterns. 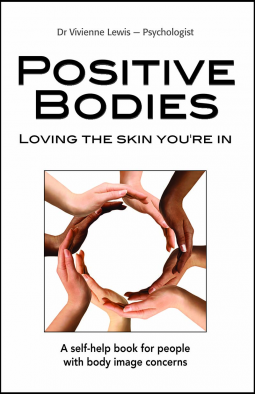 Positive Bodies is designed to equip you with the skills, knowledge, and thinking to foster a positive body image in yourself and others. It is based on tried and tested CBT (cognitive behavioural therapy) principles and features real-life examples of those who have struggled but won their war against body image dissatisfaction and self-hatred. Appropriate for men and women of any age including adolescents and children, Positive Bodies can also assist parents, teachers and counsellors wanting to help others with body dissatisfaction issues. Helpful worksheets with activities are included along with information on the warning signs of eating disorders; tackling binge eating and fussy eaters; managing stress, anxiety and depression; being a positive role model; boosting self-esteem; and where to go to get additional help. If you’ve already started your journey towards a positive body image, practising the techniques and strategies in Positive Bodies will enhance the work you’re already doing. Dr Vivienne Lewis is a clinical psychologist at the University of Canberra, Australia, specialising in eating disorders and body dysmorphic disorder. She has been an active researcher in the area of body image for over 15 years publishing scientific papers and presenting her research at international conferences. She currently supervises research students and trainee psychologists in the area of body image and wellbeing and has run numerous group programs over the past 7 years promoting positive body image as well as working individually in private practice with men, women, adolescents, and children. She also assists parents and teachers in being positive role models for children. Vivienne is a strong advocate for celebrating body diversity and reducing the anxiety and stress often associated with body image to allow us all to live a happier more comfortable life.